So much creativity! So much fun! I believe that everyone is capable of creating beautiful things. But how often do we just allow ourselves to be creative, for the sake of being creative? About 15 years ago, I discovered the quilts of Paula Nadelstern and I haven’t looked at fabric the same way since. This is a quilt I made using her technique and I can’t remember when I felt so creative. If you look really closely at this section, you will the the centre is made up of polar bear faces. Does it get any better than that? I also came to appreciate all fabrics, especially ones that are truly symmetrical. There are many fabrics that may look symmetrical, but are not. So don’t be fooled! This is a classic example of a symmetrical fabric brimming with possibilities. Although beautiful, this is not a symmetrical shape. Symmetrical simply means that you can cut the motif right down the middle and end up with mirror images. Truly symmetrical fabrics are very rare, and so you should pick them up whenever you find them. Joan, at Vibes and Scribes (in Ireland!) very graciously sent me two fabulous fabrics that just happen to be truly symmetrical. Let me show you what I did with the first one…. First, I laid it on the table and drooled. Who wouldn’t? I knew that I wanted to make a vase from this fabric. I found a shape in the fabric which I thought to be very vase-like and traced the shape onto a piece of template plastic. Next, I used that piece of plastic to make a freezer paper template and ironed it onto the back of the fabric and prepped the piece the way I normally do. Here is the beginning of my vase. I could have easily left off the outside gold trim, but I just love the effect it has. …and of course, every vase should have a base. The creative wheels starting turning and I wondered if I could make a few of the flowers from this same fabric? Of course I can! I cut a few simple shapes and starting playing. I think the key is to keep the shapes simple and let this stunning piece of fabric speak for itself! I added a dark chocolate brown piece which I used in the flower on the far right. I added this fabric to help define the shapes and so that the flowers do not look so smooshy. Of course, when you are being truly creative, you are in total control of the situation. Just do what you want to and remember…changing your mind is certainly an option. This piece is made of 3 simple leaf shapes. But look what happens when you flip them around and change the placement just a smidge. I’ll keep you posted on my progress. 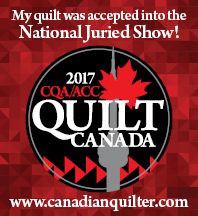 Ruth contacted me earlier this week and said my quilt will be ready to pick up next week. Here is a sneak peak. Major goosebumps!!! And last, but not least, I am working away on Block 4 of Bed of Roses. Scrumptuous! Stippling and other fun stuff! I really wish I had more to show! I have been working away on my hexie quilt and loving every moment of it. The top left corner is almost complete, then I will continue the dark brown border and then…well who knows? This quilt seems to be designing itself! My only goal was to use up all 5 meters of the beige background, which I have had in my stash for 8 years…8 years! Seriously, it’s time to let go!! I have finished all of the background stippling on the eagle block of my “Friends of Baltimore”. Turns out stippling is very relaxing, soothing and almost hypnotic. Time stands still when I work on this block. Still not sure what I am going to do with those triangles…..
Because the background is so heavily quilted, everything pops out, like the flowers and leaves, which I love because it almost looks dimensional! The eagle is a little baggy and needs some quilting. So, this is the “before” picture and in my next post you will see the “after” picture. Life is short and we are not supposed to sweat the “small stuff”. So, I am not going to worry about the cat hair anymore. I just purchased a bulk package of lint rollers and I am making really good use of them! My new and improved website is still under construction and hopefully will be ready to launch the end of next week. You have probably figured out by now that I am a huge fan of Sue Garman and her wonderful applique patterns. So, I will be selling some of her patterns on my website. And, I will be doing one of her patterns, Bed of Roses, as a Quilt-Along, complete with fabric kits! Last night I prewashed the fabrics so I could get started on the first block. So exciting! Yes, indeed, it has been a Slow Stitching Sunday! I am finally recovering from a nasty case of strep throat that left me feeling so drained that all I could do was sleep for the last 3 days, so I didn’t get much stitching done this past week. However, I thought a lot about stitching! I thought about how I wanted to quilt FOB. Sometimes it’s easier to figure out what you don’t want to do, rather than what you want to do. A process of elimination, of sorts. I knew I didn’t want to cross-hatch this quilt. Yes, it would be lovely, for sure, but I cross-hatched the last 2 quilts and I am desperate for a change. I have decided to do a combination of echo quilting and stippling in the background and just some simple quilting on the applique sections. On some of the blocks, where space permits, I would like to quilt some small motifs, like a feather or a heart. For the quilting on the applique sections, I will match the color of quilting thread to the fabric (red thread on a red rose etc). I am not sure what I will do when I come to all of those navy blue triangles… I might quilt small circles in them like I did for my Bouquet For A New Day. Hmmm….I will figure it our when I get there! So here is what I have done so far. It took me a while to find the perfect needle for this quilt (Clover Gold Eye #10). Again…process of elimination!! I am linking up to Slow Stitching Sunday and, also, Wips Be Gone. Check them both out and see what everyone is up to! My initial thought was to put “Friends of Baltimore” away for a while before starting to handquilt it. You know…maybe start a new quilt….finish up a quilt or two…I just needed a bit of “space” between the quilt and I. But, for reasons I cannot explain, I found myslef in my local quilt store on Thursday buying a king size wool batt and 9 meters of unbleached muslin for the back. I came home and washed the backing and stitched it together in three equal sections. Next thing I know, I am laying the backing and batting out (with the help of my daughter) and laying the quilt on top. And then I spent the day basting the layers together. A huge job…but well worth it. I didn’t mark the quilt because I am not sure how I am going to quilt it yet. Sounds odd, I know. To be perfectly honest, I am more concerned about how I am going to keep the cat off of it! And here is the finished top of Sue Garman’s “Friends of Baltimore”! I started this quilt about 3 1/2 years ago and loved every moment of it. Now that I am finished, I have been walking around in a bit of a fog. I miss working on it already! I said it before and I’ll say it again….this quilt is not difficult. Honestly! When I first purchased the patterns, I really didn’t believe I would ever start it, let alone finish it. But then I started looking at just the blocks by themselves, and I soon realized that the pieces (although there are lots of them!) are very manageable. Just start with one piece, and then another and then another. Before you know it, you will be on your way!! I have finally(!) finished all of the applique and embroidery on by Friends of Baltimore! Yippee! Today, I am stitching the 342 half-square triangles that will go all around the quilt. Because I am so very close to a finish, it just seems to be taking forever to sew these triangles together. If you would like to see how I stitch my triangles, you can look at this post. I am linking up to Slow Stitching Sunday and also WIPs Be Gone. Check out both sites and see some awesome stitching!